The Sai Ngam Hot Spring is one of my favourite locations in Pai to spend a few hours away from the city centre. Sai Ngam Hot Spring is surrounded by a lush, green forest inside the national park just 25-minutes north of Pai. Sai Ngam Hot Spring is located 17km north of Pai. From the centre of town, it is approximately a 25-minute drive. The best way to get around Pai is on a scooter to explore all four corners of the region. Scooters can be rented for a little as 150 Baht per day from one of the many rental stores in the centre of Pai. Alternatively, some accommodations have scooter rentals available for around the same price. A money deposit or passport is generally required for insurance purposes. If you aren’t confident with riding a scooter, you can hail a songthaew (pick-up truck with bench seats) to get from A to B. Make sure to agree on a price with the driver first before jumping in the back. 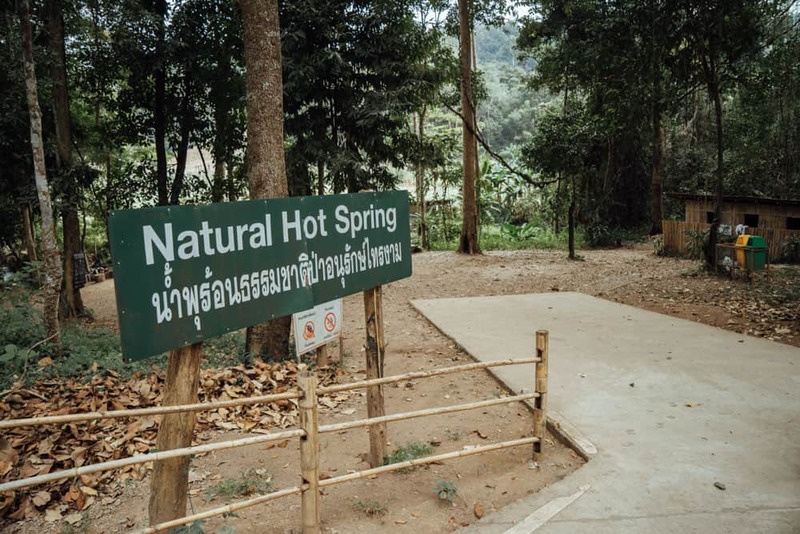 As you turn off the main road to head down to Sai Ngam Hot Spring, you’ll be stopped at a checkpoint at the beginning of the national park. There is an entrance fee of 200 Baht per person and a further 20 Baht per scooter/vehicle. This cost was far more than what I expected to pay to swim at a hot spring but I had just driven 25-minutes to get here, so I handed over 420 Baht to the man and he let us enter the national park. From this checkpoint, follow the road for another 5-minutes to Sai Ngam Hot Spring. The road is very steep and hilly so please use caution. We arrived at the entrance to Sai Ngam Hot Spring and had to pay yet another 20 Baht per person just to go swimming in the natural hot pools. In total it cost 460 Baht (USD$15) for the two of us. 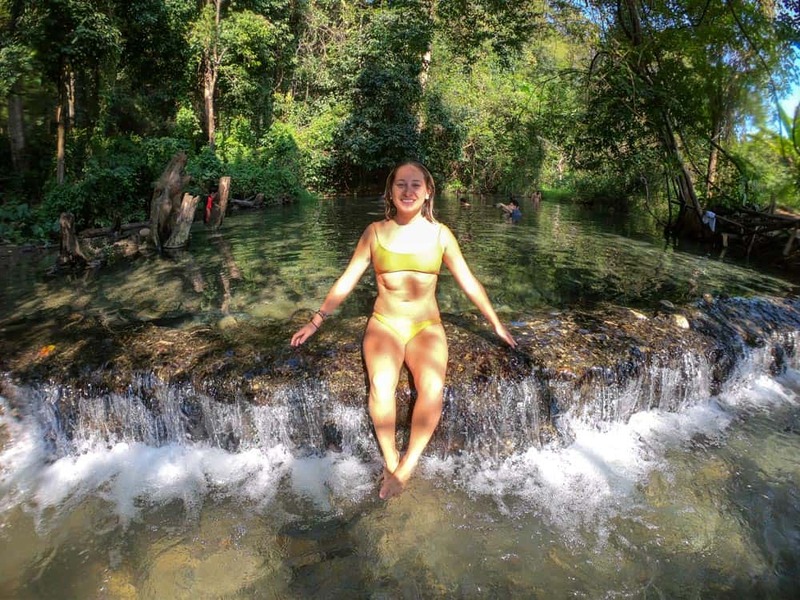 The Sai Ngam Hot Spring definitely isn’t the cheapest attraction but I must say that as soon as I got into the hot pools I was more than happy that I had come. The Sai Ngam Hot Spring is a 3-tiered cascading natural hot pool, the top one being the hottest at 34-degrees Celsius. 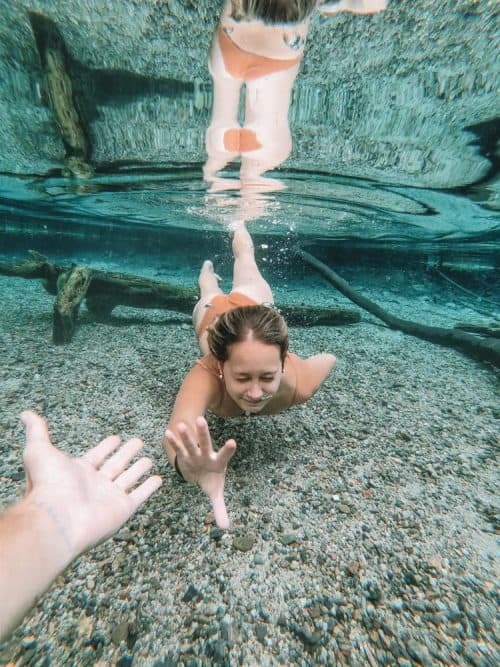 I could have spent hours floating around in this crystal clear hot spring. The water temperature was just perfect! 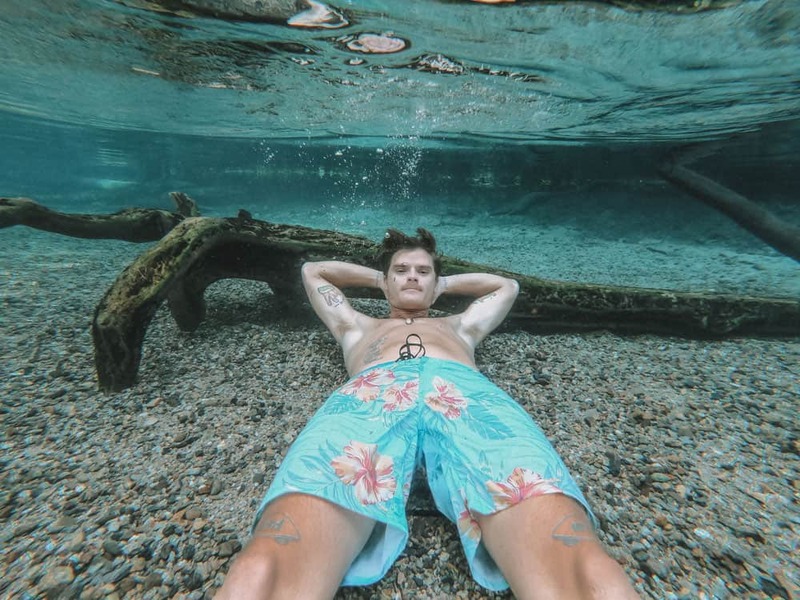 If you have an underwater camera, you’re going to want to put it to use. I don’t think I have ever seen a freshwater spring as transparent as the Sai Ngam Hot Spring. There is a timber seating area off to the side of the springs to hang out and change rooms/toilets are located at the gate entrance. Also, if you want to buy some snacks and drinks there are some small stall vendors that line the street near the carpark.